Made of poly lumber, this Amish porch glider bench will offer relaxed comfort for years. Our Amish poly porch glider bench is available in a variety of solid colors or two tone poly lumber options to fit in with your home decor. Choose from over fifteen different solid poly colors or create a two tone look. If you are looking to create an intimate seating area then you might want to consider ordering our complementary Amish Poly West Chester Bench to go with this poly lumber glider. We also offer our popular West Chester Poly Swing. The Amish Recycled Poly Lumber West Chester Glider Bench will be the most comfortable seat in your house! There are many advantages of Poly such as 1) Stays beautiful for years and years 2) No rotting. - No splinters, splitting or cracking 3) Various colors to choose from 4) Comfortable seating and always smooth to touch 5) Lower cost per year. This poly lumber glider bench is built by Amish woodworkers with a careful attention to detail and a commitment that reflects time-honored traditions of integrity, simplicity and hard work. With our Amish made outdoor furniture, you receive solid quality and attractive design. 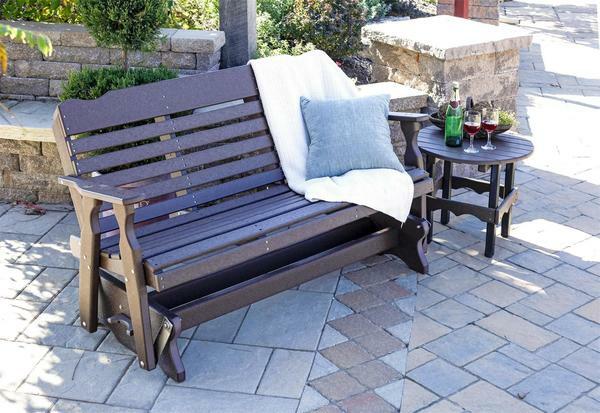 In today’s busy world, the Amish Recycled Poly Lumber West Chester Glider Bench helps you create valuable leisure time for you, your family and friends.